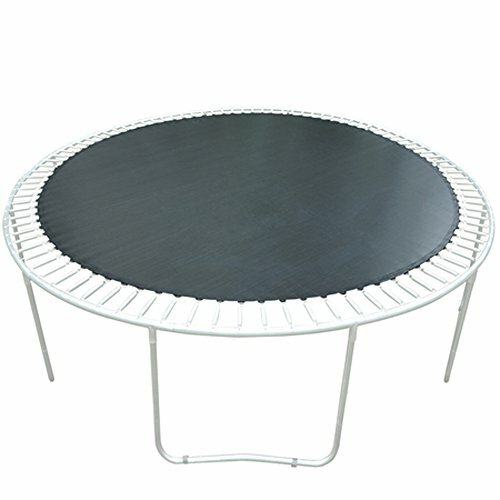 This premium jumping mat is to fit your 14ft-framed round trampoline with 7" spring and 88 spring holes. Made with Heavy duty polypropylene, the mat is treated to be waterproof, UV-resistant, scratch free and more durable. The 8 stitch lines and galvanized V-rings, features extremely high tensile strength and guarantees the mat from tearing. *1. Trampoline Frame Size - Measure outer diameter of the frame in at least 2 different places when it is fully assembled. *2. Mat Size - Check your old mat diameter of the edge fabric excluding the V-rings when it is fully extended. *3. V-ring Quantity - Count the ring quantity on your current mat or spring holes on the frame. *4. Spring Size - Make sure the distance of hooks from tip to tip fits. When we measure the mat, we use the new springs so that we suggest you replace the old springs with the new ones for the more accurate size of mat. Here are the springs for your choice. Please search 5.3"(B00QMA0VZ6), 7"(B00LWYS0MS) and 8.5"(B0109Y2400) for more information. Jumping Surface for 14' Trampolines with 80 V-Rings Spring Size: 7"